Marks and spencer Girls Denim Skirt Age 18-24 Months. Condition is Used. Dispatched with Royal Mail 2nd Class signed for. comfortable stretch denim style. pretend pockets to front actual pockets to rear. elasicated waist band with button fastening to inside to adjust if required. From a smoke and pet free home. Cute full circle lined skirt. waist 50 cm. Baby girls pretty lined soft net skirt with a stretchy waist. M&S Girls Pink Sparkle Tutu Skirt 12-18 Months BNWT. Condition is New with tags. Dispatched with Royal Mail 2nd Class. Cute baby girls tutu, 0-3 months, white with metallic multicoloured dots. Looks gorgeous when worn with a white bodysuit and lovely for tiny baby photos. As new, my daughter only wore it once for an hour or two. Smoke and pet free home. Check out my other items, I'm having a clear out. girls gorgeous m&s skirt aged 1.5-2 years. Does have a few marks but are not obvious. In that case I will always explain and still send separate. Three layers to make it full. Satin lining and pants. Ribbon trim on skirt. I have not washed this as I don't believe it has been worn, it is clean, no marks, stains or odours. Perfect for parties, smart or special occasion wear. It’s not intentional and we will endeavour to resolve any issues with a friendly service. Baby Girls cotton stripe layered skirt from M&S. • Age 3-6 months. • In great clean condition. Skirt is lined and has adjustable waist. Here's what our experts have to say about this BNWT Girls M&S Blue & White Pattern Skirt Size 1 1/2-2 Years BB310. Very soon you realise it's far too much effort for a couple of quid. So you ask yourself, surely there's an easier way?. This is a listing for a stunning little party skirt from M&S. Baby girl Aged 12-18 months. It think it is ivory although the inner label states white. The skirt is fully lined and layered with sparkly detail. There is a silver flower on the centre of the waistband. The waistband is fully elasticated. Worn possibly twice and in great condition. Any questions please ask. From a smoke and pet free home. Girls M&S Denim Embroidered Skirt. Age 18 Months to 2 Years. Denim skirt with stretch. Cotton polyester elastane. Age 1-1.5 years/12-18 months. Pink cotton Marks & Spencer Flamingo skirt in good worn condition. Age 12 - 18 months. Baby girls skirt 18-24 months from marks and spencer. Two layers to skirt. 🎀Cute Baby Girls Skirt by Marks & Spencer’s. Girls M&S denim dungarees skirt. Age 12-18 months. 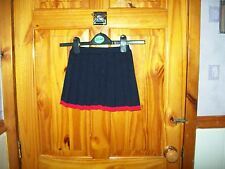 M&S Kids Girls Embroidered Skirt NEW!! • BNWT M&S BABY. LOVELY BABY GIRLS DENIM SKIRT. • AGE 3-6 MONTHS. The skirt has a built in tiered underskirt to give it a fuller effect. 12-18 months 83cms. Multi layered skirt with metallic coloured spots on. Age 12 -18 months. This item has not been worn. Girls sparkly pale pink tutu skirt, great condition has been worn twice. Pet and smoke free home, please have a look at other items, can combine postage. Baby girls marks and Spencer Indigo X 2 Skirts. One red with embroidery and one denim with floral embroidery. Both age 12-18 months both with adjustable waists. BNWOT M&S Skirt - Leggings Set. Age 3-6 Months. This is an unusual/ funky design of a skirt / leggings combination. This is one piece, giving the affect of a 2 piece set. The skirt part is darker pink with a blue ribbon feature. M&S Girls Multicoloured Skirt 12-18mths. Adored by my daughter! Condition is Used but very good condition. Elasticated waist. Very full skirt. Smoke-free household. Girls M&S denim Skirt Age 18 Mths - 2 Years. Condition is Used. Dispatched with Royal Mail 2nd Class. This is a Marks & Spencer (M & S) girl's green skirt with embroidered flowers on the front for a child aged 6 - 9 months. It has built in underwear, a bow on the front and two pockets.